The long LCC racing season drew to a close on Sunday with our double-header Open Hill Climb up either side of Quernmore Valley just outside of Lancaster, organised by Bob Muir - the first climb heading west from the River Conder towards Lancaster up Conder Bottoms, & the second east away from Lancaster up the much longer climb to Jubilee Tower on the Forest of Bowland. We were blessed with a glorious autumnal day - clear skies & warm sunshine. The roads however felt heavy, with - for those who have ridden them before - both climbs more of a slog than usual, & particularly the longer, second one up Jubilee Tower, which was ridden into a stiff breeze. But what a great event! Riders & their families, along with the enthusiastic team of volunteers who made the event possible, gathered at event HQ, Quernmore's bowling green pavilion, & before, between and after the climbs basked in the sunshine & caught up on news. If you've not tackled these climbs before (or even if you have!) why not make a note now to take part in next year's event? It's not to be missed! Lake RC's Dave Huck (pictured above, thanks to Ken Roberts) had a good day, climbing both hills fastest. He rode Condor Bottoms in a very quick 1 minute 50 seconds. That was 18 seconds faster than 2nd placed John Findley of High On Bikes, who finished in 2:08. The best-placed LCC rider & 3rd overall was Tom Brook in 2:15. Fastest vet was LCC's John Hatton in 2:34; fastest under 18 Salt Ayre Cog Set's Bobby Horton in 2:38; & fastest woman Holly Carter of Manchester Wheelers in 3:23. Two hours later the riders who'd already ascended Conder Bottoms were joined by more (with fresher legs!) for Jubilee Tower. Dave Huck of Lakes RC was again fastest, in 8 minutes & 5 seconds. And John Findley of High On Bikes (pictured above, again thanks to Ken Roberts) was again second, this time just 15 seconds slower on the much longer climb, in 8:20. Third, and also the fastest vet, was Richard Bideau of Pendle Forest CC in 8:30. Best placed LCC rider was Tom Brook in 8th, in a time of 9:13. Fastest woman was Mary Wilkinson of Yorkshire Road Club in 9:20; and fastest under 18 was again Bobby Horton of Salt Ayre Cog Set in 10:34. And a special shout out to Kent Valley RC's Peter Knott, who at 79 years young proved that - however hard a pursuit it might be - age needn't be a barrier to hill climbing. Congratulations to all riders who finished one, the other, or both climbs, & commiserations to those riders who experienced mechanicals and did not finish. And massive thanks to everyone who helped make the event happen. The combined results of the two climbs determined two trophy winners - Dave Huck's combined time of 9:55 sees him hold the G. M. Brennan Trophy for the next year; and Hollly Carter of Manchester Wheelers combined time of 16:46 sees her hold the Flossie Mitchell Cup for the next year. The Jubilee Tower Hill Climb this year was also the chosen event for the NLTTA hill climb championship and as well as winning both individual events Dave Huck (Lakes Road Club) is also the 2015 NLTTA Hill Climb Champion. Congratulations to him. Links to really great photos taken of the riders on both climbs by Ken Roberts are here: Conder Bottoms, & Jubilee Tower. "I would like to congratulate not just the prizewinners but everyone who entered and rode our events supporting our new venture of two hill climbs out of Quernmore Valley. We will be back next year and if you enjoyed today’s events please tell your club mates and help our event to grow. I would also like to thank my wife Jann, who was only just starting to recover from a debilitating ‘bug’ she had for the last week, for setting out the event HQ & managing signing on as well as providing copious amounts of tea, coffee, biscuits and a mountain of malt loaf. Thanks also go to Brian, the stentorious Scot, for manning the results & prize presentation side of things and the timekeeper for both events, Gail Warren, as well as everybody out on the road (Sue, Darren, Peter, John, Dave & Ken all of whom share equal credit for making the event such a success. Hope to see you all again next September but in the meantime you are welcome to enter any of our series of evening club time trials stretching from March to September including both of today’s climbs at mid-summer. And finally, full results from both hill climbs are available by clicking on 'Read more' below. What are we going to do on Thursday evenings now then?! This was the last of this year's series of 30 Salt Ayre time trials. We're past the autumnal equinox, the nights are drawing in (& getting colder), and depending on your inclination, it's time to start getting in the miles, to turn to track or X, or hibernate! Most important, a HUGE thank you to the core team of people who have made 2015 such a success - the overall organiser & time keeper Bob Muir, Jan Muir & Carmen Jackson on the signing-on desks, Tom Jackson on refreshments, & Tim Norton & Brian Kennedy for sorting volunteers & helping to make things run smoothly. And to all of you who have helped in all kinds of ways, big & small, across the season. Thursday nights just wouldn't work without a whole bunch of people mucking in. So thanks to everyone, and let's hope we can sustain the success next year. And of course, thanks too to all the riders. Another 78 last night, taking the overall figure of time trials at Salt Ayre this season above 2000 - stunning! It wasn't the fastest night, cool & blustery, but it stayed dry & for those not concentrating too hard on the effort there was a fine sunset followed by a lovely moon! Of 16 riders at 2 miles James McCracken was fastest in 5:39, followed by Dylan Edwards in 5:58. Max Davies was 3rd in 6:10. Amongst the girls, fastest was Ella Cornwall in 7:32, followed by Zoe Tunnadine in 8:13 and Hannah Dykes in 8:38. But really well done to all the youngsters who've given the Salt Ayre 2 mile time trial a go this season, and we look forward to you coming back for more next year. 24 riders took on 6 miles. First off were Flo Horton & Megan Howarth, both 12 years old, riding as a 2-up & finishing in 19:15. Of the 22 6 mile solo riders Ben Pennance was fastest in an impressive 15:48, more than a minute ahead of 2nd placed James Tunnadine in 16:53 & James McCracken - still fresh after his effort at 2 miles - in 17:06. Fastest girl was Nancye Roberts in 20:01. At 10 miles two sets of lads rode 2-ups: the pair of William Dykes & John Roberts - both 12 - looked good as they rode to 27:38; and so too did 12 year old Adam Hodgson & 11 year old Isaac Atkinson, who took just 20 seconds more, finishing in 27:58. Ian Sibbert was fastest of the solo riders in 22:44, followed by Sean Casson in 22:55 & Andrew Barlow in 23:08. The top 3 women were Sandra Ashton (30:10), Dawn McCracken (30:45), & Sue Holden (31:10). As always, full results below. 35 riders at 10 miles, 28 at 6 miles, & 14 at 2 miles gave a total field of 77 - and we're on course to record over 2000 rides during 2015 at Salt Ayre time trials next week - quite an achievement! There were many great performances among the 14 riders at two miles, with all the smallest Cog Setters getting steadily faster (& some seemingly in leaps & bounds! ), the parents and other onlookers around the track cheering them on. This week's best time of 6 minutes exactly was recorded by Max Davies. 2nd was Dylan Edwards in 6:16, 3rd Ethan Yates in 6:21, & 4th William Statham in 6:34. Fastest of the girls was Amelie Earnshaw in 6:55, followed by Ella Cornwall (7:22), Pippa Darlington (7:23), & Jess Pugh (7:25). At 6 miles there were far too many cracking rides to mention. An incredible 18 of the 28 riders broke the 18 minute, 20 mph barrier. That's a lot of potential stored up for the future! Isaac Weber did a very impressive ride to get the fastest time on the night, of 14:33. He was followed by Ken Roberts (15:23) & William Dykes (16:01). The fastest three rides amongst the girls, meanwhile, were done by Sasha Oldham (17:26), Flo Horton (17:59), & Megan Howarth (19:13). Brilliant stuff all round! Of the 10 milers former Cog Setter Sam Monkhouse continues his development as a very classy rider and rode fastest of everyone on the night, finishing in 21:58. Next were Ian Sibbert (22:44) and Andrew Barlow (23:12), with another younger rider, Kyle Lewis, riding powerfully to fourth in 23:30. The fastest woman was Louise Goddard in 28:22, and Jim Lawley once more triked successfully around Salt Ayre's bends to 34:39. Well done to everyone who rode, and to all those who continue to volunteer as this long road season starts drawing now towards a close. And thanks to Clarkson Hirst Solicitors for their support. It seems safe to say that the Thursday evening time trial has turned into a pretty solid tradition, and weekly highlight for many, these last few years. Next week is the last of the year, so please try to get along to see the time trial year close with a fanfare! And finally, don't forget that on Sunday 27th September, thanks to Bob Muir, Lancaster CC host a double Open hill climb - Conder Bottoms at 10 am, followed by Jubilee Tower at midday. If it's like last year, it'll be a superb occasion, with plenty of opportunity to recover between the rides & to chat with club-mates & fellow competitors whilst supping tea & eating cake at the event HQ. And if you're quick, although on-line entry has closed, it's not yet too late to enter - but you must get in touch with Bob (see his contact details on the 'Contacts' page of this site) & get your entry to him by Saturday 19th September at the very latest. Entry is £7.50/hill, on a CTT entry form. If you'd like to enjoy the occasion without the pain, then you could provide cakes &/or volunteer to marshall - help is still needed. Or simply come along & cheer the riders up the steepest sections! As ever, full results from this week's Salt Ayre time trials are available by clicking on 'Read more' below. A dry but blustery evening for the latest in this season's Thursday evening time trials with an impressive turn out of 86 riders (37 at 10 miles, 28 at 6 miles, & 21 at 2 miles). At 2 miles Dylan Edwards was first ahead of Jack Tipler by the slender margin of four seconds, finishing in 5:54 against 5:58. Just two seconds further back, and edging under the magic 6 minute mark by a fraction of a second, was Bob Muir - temporarily parking his time-keeping duties for a rare appearance on the track - which was very good to see (after facilitating some 2000 rides over the course of this year, it's fitting that Bob should eventually get a go himself!). The fastest girl was Megan Howarth in 6:32. At 6 miles Ben Pennance finished in 15:15, almost a minute ahead of next placed rider, the much younger William Dykes who rode to an exceptionally good time of 16:12. Graeme Cook was third in 16:30, just ahead of James McCracken (16:32) & Adam Hodgson (16:34). Next was fastest girl Sasha Oldham in 16:56. At 10 miles George Wharton was the fastest rider on the night, though looking again at the splits we think the (alarmingly fast!) time with which he was credited on the night was a minute too fast, and his actual time should be 22:07. Sorry George! Nonetheless, George was over half-a-minute quicker than next-placed Ian Sibbert (22:48), who was followed by the Barlows, Ben in 22:55 and Andrew in 23:06. The fastest woman was Niamh Lewis in 26:14. Thank you to all who helped out on the night, & to Clarkson Hirst Solicitors for their support. If you fancy having a go at a time trial before the end of the season, there are only two weeks left, so get in touch & then come down to Salt Ayre to have a go! Sunday saw our Open 25 mile time trial at Levens, organised by Club Chair Brian Kennedy (with the usual array of helpers, of course - to whom big thanks). Brian reports that it was a lovely morning, cool & still for the early starters; then warming nicely and with a slight breeze beginning to rise by the end. So there were some fast times, but an emphatic win of over two-and-a-half minutes for North Lancs RC's Steve Irwin - the only rider to break 30 mph & record a sub-50 minute ride; not only that, Steve set a new event record and was the best vet on standard! Congratulations to him. Steve rode the 25 miles in 49 minutes & 30 seconds. In second place, at 52:07, was John Morgan of Preston Wheelers. Steve Daintith of CoverYourCar.co.uk Race Team was third in 53:33. Preston Wheelers took the team prize, with 2nd-placed John joined by clubmates, 4th-placed Paul Fleming (53:55) & 5th-placed Gethin Butler (54:14). All up, 30 of the 49 finishers cracked the hour; among them was Thursday evening Salt Ayre time trial regular Ian Sibbert, coming home in 58:02. Well done to all of those who finished, and especially those who recorded personal bests; & commiserations to the three riders who didn't finish. The fastest woman was Theresa Taylor of Preston CC in 1:03:54. The only LCC rider was Ken Peasnell, who clocked 1:10:23. Thanks to all the riders for taking part, & to the team who made it happen. Click on 'Read more' below to access the full results. 2015 has now had more week's containing a Salt Ayre time trial on a Thursday evening than not! And there are still three more weeks to go! With the schools returning, the 27th of this season's 30 week series saw a resumption in pre-school holiday participation levels. LCC's President & Racing Secretary, and the man without whom this event which has become such a foundation of the club cycling calendar would not happen, Bob Muir says 2015 is already the most successful season of time trialing at Salt Ayre. In 2012 we had 975 individual rides recorded; in 2013 this increased to 1118 and increased again in 2014 to 1263. With 74 rides tonight (30 at 10 miles, 24 at 6 miles, & 20 at 2 miles) there have already been 1888 individual rides. So with another three weeks to go we may exceed 2000 rides for the season. That's some achievement (for everyone concerned)! Clearly not everyone enjoyed too much ice-cream over summer, & there were some impressive times - including quite a few PBs - on one of the best evenings of the year so far - warm, dry & almost still. At two miles three riders cracked the magic six minute, 20 mph barrier - fastest was Harry Shaw in 5:39, followed by Jack Tipler & Dylan Edwards in 5:58 & 5:59 respectively. Congratulations lads! The fastest girl was Kirsty Maher in 6:51. There were some super-quick times at six miles too, with Kyle Lewis fastest in 14:13, followed exactly half-a-minute later by Isaac Weber (14:43). In third was the much younger Adam Hodgson in 16:45. Four more riders cracked the 20 mph, 18 minute barrier - James McCracken (16:49), Harry Coulthwaite (17:21), Karen Gay (17:32), & Chris Barlow (17:40). The fastest of the younger female riders was Flo Horton in 18:41 (& thanks to her for the artistic 'water bottles on the ground' photo!). At ten miles Andrew Horn again showed himself to be probably the strongest rider around Salt Ayre's loop this year - finishing in an excellent 21:37. He was followed by Ian Sibbert & Adrian Dalgleish in 22:16 & 22:24 respectively. Three other riders cracked the magic 25 mph, 24 minute barrier - Andy Barlow (23:10), Tom Oldham (23:31), & John Hatton (23:59). A little further back, 14 year old Sam Pugh continues to look stronger & faster, recording an excellent 24:19. Jenny Evans was the fastest woman, in 25:35, followed by Kerry Oldfield in 26:44. As ever, big thanks to Clarkson Hirst Solicitors for their support of the series, & to all the many people who helped out in ways big & small. Club cycling depends on a wide range of people making all kinds of contributions, and whatever you offer will be gratefully received. To see the full results, please click 'Read more' below. Our fourth & final Bank Holiday Monday time trial at Levens took place on a fast morning, and the times reflect it. The biggest congratulations must surely go to Tom Brook who - unless I'm mistaken - becomes the first rider in Club colours to break 20 minutes & exceed 30 mph over 10 miles, thus setting a new Club record. Tom finished the event second in 19:55, just 9 seconds shy of event winner (& the only other rider to break 20 minutes) David Allonby of Cleveleys RC. The photo below is of Tom competing the previous day in the National 10 mile Time Trial Championship, where he rode to joint 74th place (of 144 finishers) with 21:46. No doubt there were plenty of personal bests, including amongst LCC riders. Other than Tom, those who rode in Club colours were Sam Monkhouse (21:31), John Hatton (22:23), Malcolm Neil (26:33), Nigel Neil (26:40), Karen Gay (30:00), & Mary Neil (33:20). Many thanks to everyone who made the event happen - organisers, time-keepers, pushers-off, sign-on & refreshments team, & marshals. And as ever, full results (though not in finishing time order) are below. Sunday 23rd August saw the 8th & final event in this season's Inter Club Hilly Time Trial competition - The Circuit of Wild Boar Fell from Sedbergh, which replaced the planned Shap & Back ride because of temporary traffic lights on the A6 at Shap. The weather was good, just a bit windy. The event was won by Kent Valley's Peter Thomas in 1:11:50. We had 2 riders in the field of 15 - Tom Brook who came a fine 2nd, in 1:12:51; and John Hatton who finished 6th in 1:22:05. So with Tom & John's participation in the final event, & only the one Lakes RC rider, we did a last-minute move up from 3rd to 2nd! But Kent Valley were clear winners this year, getting an impressive number of riders out not only for their 'home' events, but away ones too. Congratulations to them. But let's hope - as it looks like it will - the series runs again next year, & we can get our revenge! And well done to the individual riders who amassed most points for their clubs: Kent Valley's George Wharton (297), LCC's Tom Brook (291), Lake RC's Craig Steele (194), Barrow CW's Sean Casson (132), & Lune's David Deakins (78). Huge thanks to Andrew Barlow for organising the series, & for all those who helped out across the series. And yes, may there be more next year! 70 riders took part in the 25th Thursday evening of time trialling at Salt Ayre so far this year; 14 at 2 miles, 22 at 6 miles, & 34 at 10 miles. Fastest over two miles was Max Davies in 6:16. Ethan Yates was 2nd in 6:38, and third was the fastest girl Megan Howarth, in 6:46. At six miles Ben Pennance was fastest in 15:46, just two seconds quicker than 2nd-placed Isaac Webber. Lydia Shenton was the fastest girl, in 19:08. Over ten miles Ian Sibbert was the fastest in 22:17 from Adrian Dalgleish in 22:56, with the fastest woman third-placed Lynn Hamel in 23:05. 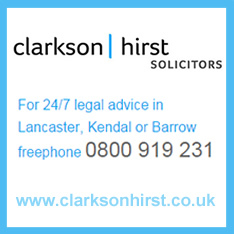 Thanks to Clarkson Hirst Solicitors for supporting the Thursday evening time trial series, and everyone who helped out on the night. A special shout out to those who have turned out week-in, week-out throughout the season and do the bulk of the work - time-keeper & results maestro Bob Muir, Jan Muir & Carmen Jackson on the registration desk, Tom Jackson who sorts all the refreshments, & Tim Norton who pulls the rest of the volunteers together - please remember that we couldn't ride without them, and be extra-specially nice to them! Click below for the full results.